He may have been the first to make an air-sea rescue when he saved a crashed pilot by making a landing on Lake Michigan in August, 1911 ? 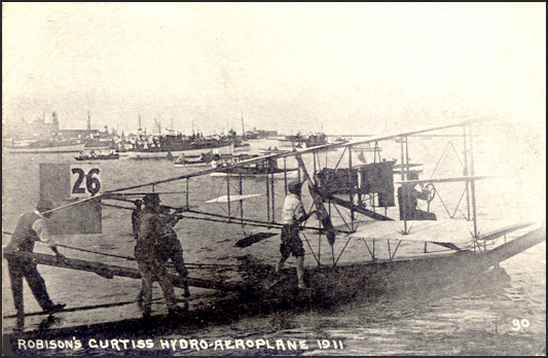 Hugh Robinson ascended from the Mississippi River in this Curtiss seaplane on October 8, 1911. Here he accepts a sack of mail, which he flew to the east side, then back to Missouri again. 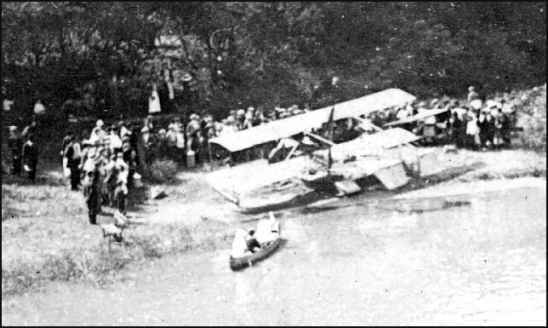 This was the first seaplane flight in St. Louis. CENTENNIAL WEEK IN ST. LOUIS, 1909 On July 5, 1908, a petition to incorporate St. Louis as a town was drawn up, and two days later it received 80 signatures out of a possible 101 of the "taxable inhabitants." The 100th anniversary of this event was celebrated from October 3 to October 9, 1090 -- Centennial Week.The officials planned parades, luncheons, banquets, balls, concerts, receptions, naval demonstrations and aerial activities. This last item was to be the highlight of the week. St. Louis would witness balloon races, dirigible maneuvers, and for the first time in its history, sustained airplane flights. A number of local inventors also expressed their intentions of exhibiting machines during Centennial Week. Frederick Barolom, the son of the president of the National Bank of Commerce, built an airplane at his home and planned to fly it during the celebration if he could find a suitable engine. It was a monoplane 7 feet long and 26 feet in span, with a single propeller. 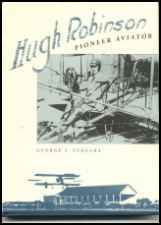 Hugh A. Robinson, a member of the Aero Club, perfected his third airplane at the shops of the Dorris Automobile Company, where he was employed. 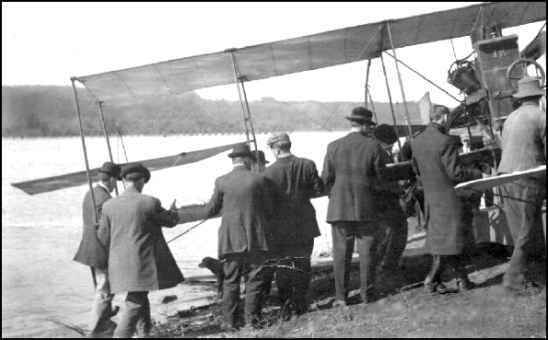 Patterned after the Hugh Latham monoplane, it was 34 feet long and had a wing area of 240 square feet. The machine weighed 600 poounds and, propelled by a 25-horsepower motor, it ws expected to attain a speed of forty miles per hour. 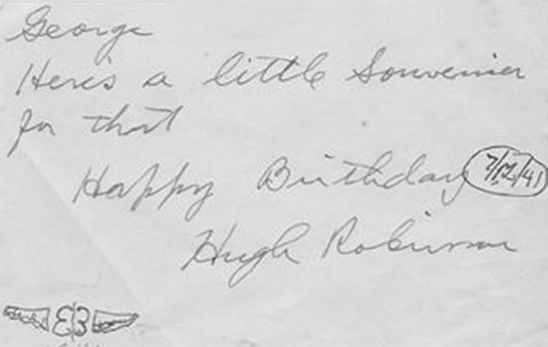 On October 4, St. Louis' Hugh Robinson brought his airplane to Forest Park for trials, but it did not have sufficient power to rise from the ground. On October 7, Hugh was on the Forest Park field, but by the time he was ready, it was too dark to fly. Presented to George Arnold, by Hugh Robinson. THE INTERNATIONAL AERONAUTIC TOURNAMENT, 1910 In 1910 the Aero Club of St. Louis experienced the greatest year in its history. The organization took part in two airplane meets, an international balloon race, a convention of aero clubs, a national aero show, the staging of a spectacular flight over the Mississippi River, and the establishment of the first permanent airfield in St. Louis. 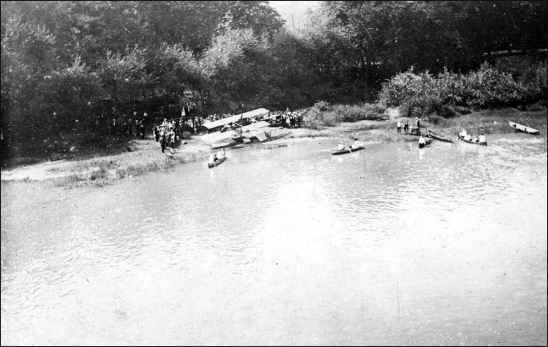 At the Washington Park field an aviation meet for novices was conducted by the Aero Club in July 1910. The tournament was deemed a success, although it saw "no real flying." It did, however, stimulate the building of aircraft by many residents of the city. CHIRP, SATURDAY, AUGUST 17, 1935, DETROIT MICHIGAN I notice on the last page under "Twenty-Five Years Ago Today," in the last issue of the Chirp, it tells about Lincoln Beachey taking part in the "greatest air carnival" at Los Angeles in 1910. I am wondering who furnished the dope that Beachey flew at the 1910 Los Angeles meet. 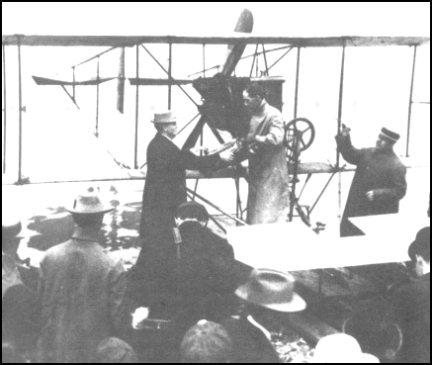 If I am not mistaken, that is the exact date when Glenn Curtiss and I were flying at this meet and Beachey popped in on us and wanted to become an aviator. So Curtiss told me to take him out over the back stretch and let him take a hop. This was the last hop that pusher ever made for he piled it up and it was a complete washout. Fortunately Beachey crawled out unhurt. Curtiss said he had no more planes to wreck just then and Beachey disappeared. It was some time later that I heard he had learned to fly. In fact, as I remember, when Ely had the contract to fly from Key West to Havana, Curtiss discovered that the contract called for two aviators. 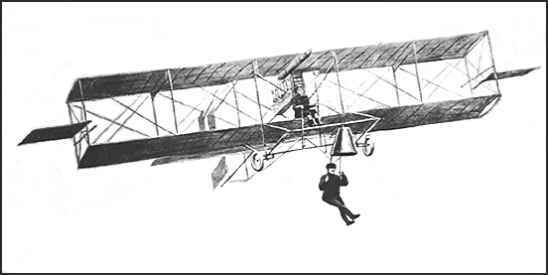 Whether or not the second aviator could fly did not matter, so Curtiss laughingly decided to send Beachey. Accordingly, Beachey went to Key West with Ely in one of the old machines. But from information I gathered later, he piled up the old machine at Key West and it was not until some time later that he actually began flying. St. Louis Mo, January 12th 1911. Roberts Two Cycle Marine Engine. "For A Purse of $20,000, Robinson is Chosen to Make the 1,917-Mile Journey From the City of Minneapolis to New Orleans. He will make the flight, via Memphis, in his Hydro-Aeroplane Going by Easy Stages." Transcribed by Bob Davis - 11-16-03 "St. Louis, Sept. 17. - Hugh K. Robinson, the aviator, has been nominated by the Trans-Mississippi River Flight association to make the Minneapolis-to-New Orleans hydro-aeroplane flight of 1,917 miles. Robinson will start from the survey of Lake Calhoun in the heart of the residential district of Minneapolis Wednesday morning, October 11. 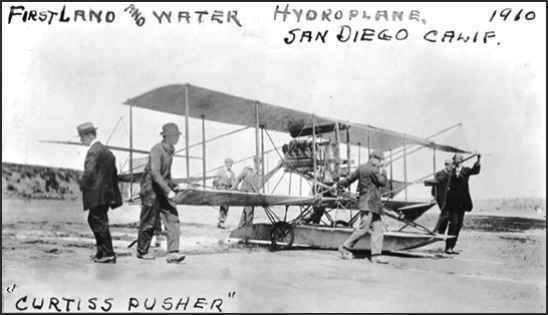 He will fly for a purse of $20,000 raised by the river cities in which he is to give hydro-aeroplaning exhibitions. His trip down the river will be in easy stages. The start is timed for the opening of the deep waterways convention in Chicago. Every effort will be made to call attention to length and the possibilities of the Mississippi river and the importance of cities located on it. 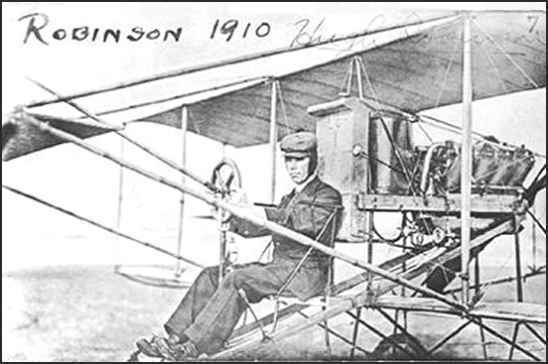 Robinson was selected from over forty applicants...."
FIRST SEAPLANE FLIGHT IN ST. LOUIS, 1911 Robinson ascended in his Curtiss seaplane at 10:38 a.m. from the foot of North Market Street. He headed downstream and sailed over Eads Bridge at a height of 750 feet. In a more extensive repetition of Thomas Scott Baldwin's Red Devil flight of 1910, Robinson then turned north and flew under Eads Bridge, over McKinley Bridge, and under Merchants' Bridge. Turning south, he steered the hydroplane under Merchant's Bridge a second time, and under McKinley Bridge, as he touched the water for the sixth time during the demonstration. This was the first time St. Louis had seen a seaplane in flight. 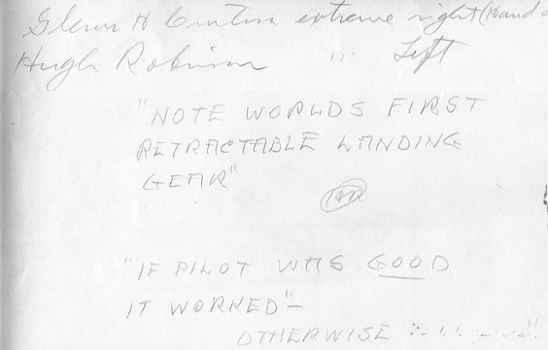 "Robinson soared for more that twenty minutes and never in the history of aviation in St. Louis has a more entertaining flight been witnessed." He had carried a sack of mail to the Illinois side of the river, but no arrangements had been made to leave it there, so he brought the bag back with him to the St. Louis post office. MINNEAPOLIS-NEW ORLEANS HYDROPLANE FLIGHT Immediately thereafter, the St. Louis aviator collected a $1,000 stipend from the Aero Club for the flight, and then departed for Minnesota to make an unprecendented air trip down the Mississippi River from Minneapolis to New Orleans. This daring venture had been proposed by Albert Bond Lambert in the spring of 1911. In mid-September, the Trans-Mississippi Valley Flying Association had been formed, and it had solicited $15,000 from Minneapolis, St. Louis, Memphis, New Orleans, and other communities along the route to pay the expenses of the undertaking. 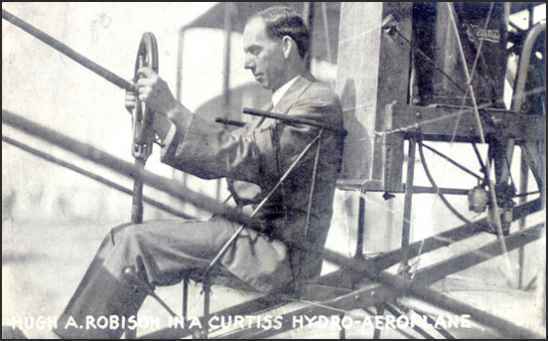 Hugh Robinson was to start the flight on October 13 under the auspices of the Curtiss Exhibition Company. HUGH A. ROBINSON - 1911 Vintage postcard showing what may be Robinson's seaplane along the Mississippi River, on October 19, 1911. The scene looks very much like the other photos taken of it at that location, which can be seen on this web site and in George Vergara's biography about him, which you have. 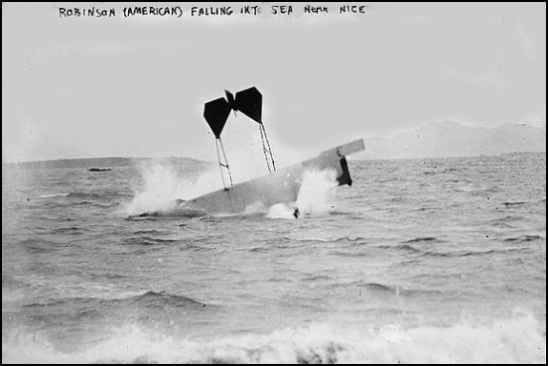 making a crash landing on water near Nice, France, 1912. ONLINE RESOURCES If you search for "Hugh Robinson" +aviation -airport, using the Google search engine, (5-7-05), you will find about 139 links. You may want to sample many of the available sites, as time permits, but I heartily recommend that at least you visit the following. Photos of Aeromarine employees This page on the Aeromarine website offers a beautiful photograph of Hugh standing alongside an Aeromarine Model R-13. It is accompanied by a brief resum� of his activities with the company about 1917. You can access the page by clicking on the title above. "Hugh Robinson (1881-1963) was a daredevil, a compulsive inventor, an important figure in the early hstory of American aeronautics, and one tough customer. He survived test flights, fifteen serious crashes, the "Circle of Death" circus act (his own invention), and spectacularly dangerous international air shows. Based on the Robinson family's trove of early aviation memorabilia and 82 rare photographs, this biography dscribes his passage from childhood--when he attempted to fly his homemade bicycle off a 100-foot-high-hill- to his final years as a consulting enginer for National Scientific Laboratories in Washington, D.C......."
"From time to time, in the body of scholarly writing, there emerges a work of commanding importance. Somtimes this paper will do more than satisfy a committee; sometimes it will go beyond a noble contribution to the sum of our knowledge and will also entertain the reader. Occasionally it will be couched in plain, easy-to-understand journalism, designed to captivate a person with a sense of being there. City of Flight is all of this. James J. Horgan transports his reader into history; into the basket of the Atlantic, as the 19th century balloon crashes into the timber of upstate New York, a thousand miles after its takeoff from St. Louis. Into the Red Devil, as Thomas Scott Baldwin flies his flimsy biplane between the Mississippi River and the arches of Eads Bridge. Onto the struts of the Sky Cycle, as a 15-year-old boy pedals his little gas-filled dirigible over Forest Park. Onto Art Hill, to cheer the flyover of America's newest hero, Charlese A. Lindgergh, in his Spirit of St. Louis, in salute to the city which made it all possible. This is an epic set in the very cradle of aviation history - the City of St. Louis - now, as it was in the beginning, the City of Flight."